New product! Oxygen with your AED.....what an excellent idea! Please note: AED shown in image is not included. OnSite AED."" id="3550" onclick="document.getElementById('radio-3550').checked=true;validateValues(document.add,1);selectOption(document.getElementById('radio-3550'));"> "I confirm my AED is the Philips HeartStart OnSite AED." The LIFE®StartSystem is designed for immediate easy first-aid oxygen administration, and if needed before fibrillation or after successful defibrillation. This system is for use with the Philips HeartStart OnSite AED. This system weighs only 8 pounds (with the AED!) 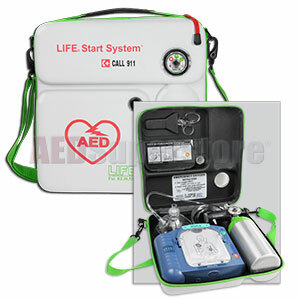 and is smaller than a briefcase at 12"H x 12"W x 3"D. Durable and water resistant, this quality oxygen/AED case ships complete with a pre-filled LIFE 6&12 lpm "Normal & High" Emergency Oxygen Cylinder, and Adult/Child CPR Mask, and oxygen supply tubing. The oxygen system is simple and easy to use with external two-step instructions. And best of all, you can easily replace the disposable cylinder with LIFE Spare Cylinder for LIFE Start System, or it's refillable at low cost by any compressed gas distributor using the universal CGA #870 fitting. The M4 cylinder holds 4.0 cu. ft/113 liters of O2. A 6 liter flow rate will yield up to 18 minutes of oxygen. The easy-open knurled knob valve requires no tools to open, and prevents accidental turning-on during transit. Note: Because all LIFE®StartSystems are shipped completely filled with oxygen and ready-to-use, they must be shipped via UPS Ground.